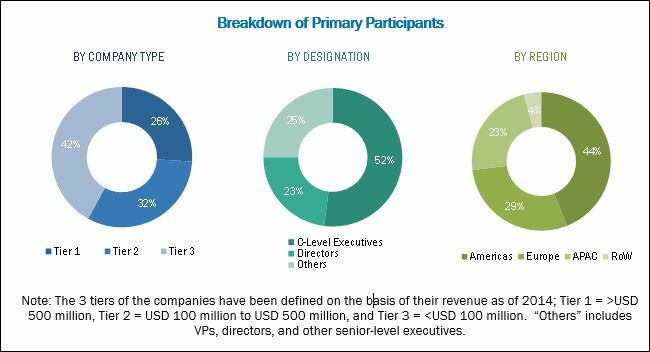 [140 Pages Report] The RF over fiber market was valued at USD 291.1 million in 2017 and is expected to reach USD 566.1 million by 2023, at a CAGR of 10.97% between 2018 and 2023. The base year considered for the study is 2017, and the forecast period is between 2018 and 2023. The research methodology used to estimate and forecast the RF over fiber market begins with obtaining data on key vendor revenue through secondary research (the Federal Communications Commission (FCC), the International Telecommunication Union (ITU), and the GSM Association). The vendor offerings have been taken into consideration to determine the market segmentation. A combination of top-down and bottom-up approaches has been employed to arrive at the overall size of the global RF over fiber market from the revenues of key players in the market. After arriving at the overall market size, the total market has been split into several segments and sub segments, which have then been verified through primary research by conducting extensive interviews with people holding key positions such as CEOs, VPs, directors, and executives. The market breakdown and data triangulation procedures have been employed to complete the overall market engineering process and arrive at the exact statistics for all segments and sub segments. The breakdown of profiles of primaries has been depicted in the figure given below. The RF over fiber market comprises major players such as Finisar (US), HUBER+SUHNER (Switzerland), Emcore (US), Gooch & Housego (UK), and Seikoh Giken (Japan). All the above-mentioned companies have their own R&D facilities and extensive sales offices and distribution channels. The products of these companies have applications in various industries. The report provides the competitive landscape of key players, which indicate their growth strategies pertaining to the RF over fiber market. Optical Zonu (US) announced the launch of ZONUConnect Base Station-to-DAS Fiber Transport System for easy, web-based set-up and SNMP remote monitoring and control. Finisar announced the launch of Integrated Tunable Transmitter and Receiver Assembly (ITTRA) for easy customer integration into coherent line cards or DCO (Digital Coherent Optics) transceivers, enabling customers to accelerate their time to market and reduce program and development costs. ViaLite signed a partnership agreement with Beijing Pace Electronics Co., Ltd. (China) to bring leading products of ViaLite more widely to the Chinese market through the distributorship of Beijing Pace. Broadcom signed a series of MoU agreements with several companies in China to expand its strategic relationships in the APAC region and drive continued innovation in high-growth markets such as home entertainment and the digital home. HUBER+SUHNER acquired Inwave Elektronik AG (Switzerland), an expert in the microwave and RF-over-fiber solutions. This acquisition allowed HUBER+SUHNER to strengthen its technological competence in the radio frequency systems business. Avago Technologies signed an agreement to acquire Broadcom Ltd. (US) for USD 77 billion, including cash and stock transactions. The acquisition took place to serve the semiconductor industry and benefit the shareholders of both the organizations. The combined entity was named Broadcom, Inc. 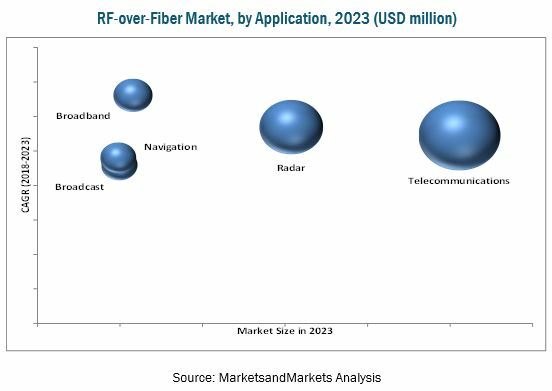 The RF over fiber market is expected to grow from USD 336.3 million in 2018 and reach USD 566.1 million by 2023, at a CAGR of 10.97% between 2018 and 2023. The growth of this market is propelled by the rise of 4G, LTE advanced, and other new standards, along with the increased spectrum efficiency. The market, considered in this report has been classified on the basis of frequency bands, namely, L, S, C, X, Ku, and Ka. The L band is expected to be the largest market based on frequency band by 2023, which has been the most commonly deployed frequency band across the world. L-band RF over fiber solutions find their applications in low earth orbit satellites, military satellites, and terrestrial wireless communications such as GSM mobile phones. RF over fiber products can be used in applications such as telecommunications, broadband, broadcast, radar, and navigation. The report provides a description of each of these application areas of RFoF. Telecommunications is expected to account for the largest share of the microwave transmission equipment market between 2018 and 2023. The emergence of Industrial Internet of Things (IIoT) and machine-to-machine (M2M) communication solutions is also expected to boost the growth of the RF over fiber market for telecommunications applications during the forecast period. The RF over fiber market for the civil vertical is expected to grow at the highest rate between 2018 and 2023. The civil vertical is driven by the expansion of LANs and data centers as electronic data transmission has become an essential requirement at workplaces. The rising investments in building new data centers and upgrading them; increasing use of big data analytics and IoT technology; and growing need for data center collocation and managed services are the factors driving the growth of the RFoF market for the civil vertical. APAC accounted for the largest share of the global RF over fiber market in 2017. The demand for RFoF products in this region is largely driven by the increased demand for higher bandwidth data services from a large number of smartphone users in this region, particularly in China and India. These 2 countries are among the largest adopters of smartphones, and the consumption of mobile data is also significantly high in India and China. The increasing government projects and infrastructure developments for the expansion of networks such as FTTH, FTTC, and FTTB will also drive the demand for RFoF products in Asia Pacific. The increasing expenditure on smart devices and the growing use of internet applications, such as video streaming, data transfer, IoT, and OTT content, have led to the growth of the RFoF market in APAC. APAC is estimated to exhibit the highest growth rate in the RF over fiber market during the forecast period. One of the key restraining factors for the market is the high installation cost of RFoF products. This report describes drivers, restraints, opportunities, and challenges pertaining to the RF over fiber market. In addition, it analyzes the current market scenario and forecasts the market till 2023, including the market segmentation based on component, frequency band, application, vertical, and geography. A few major companies operating in the RF over fiber market are Finisar (US), HUBER+SUHNER (Switzerland), Emcore (US), Gooch & Housego (UK), Seikoh Giken (Japan), Apic Corporation (US), DEV Systemtechnik (Germany), Foxcom (Jerusalem), Glenair (US), Optical Zonu (US), and Vialite Communication (UK). These companies have developed innovative products that can be served in the RF over fiber market. Today the capabilities of wireless networks are rapidly improving, thereby generating demand for higher bandwidth and related services. With the increasing network traffic, due to the adoption of connected high-capacity devices such as tablets and smartphones and the availability of the increasing number of broadband multi-media services, customers have unprecedented demand for wireless access to high-speed data communications. Hence, they purchase or deploy additional systems to address higher bandwidth internet connectivity demands. As the number of internet users is on the rise, the bandwidth per user is expanding, thereby increasing the demand for high bandwidth, as well as bandwidth on demand in metro-core networks. An RFoF module is used in various military applications to meet the reliability and durability requirements. RFoF can offer substantial benefits for optical communication systems and information transmission aboard vehicles used in military applications. RFoF is used for shelter connectivity and safety of the control center in harsh environments. The use of fiber optic cables in traditional RF systems makes it possible to position the shelters far away from the antennas while ensuring that the links between the antennas and the shelter remain secure. FTTx is any broadband network architecture that uses fiber optics as the optical medium to transmit information in a local loop used for last mile telecommunications. FTTx comprises the many variants of fiber optic access infrastructure including FTTH, FTTP, FTTB, FTTN, and FTTC. Fiber has evolved as an essential component for network evolution because of its ability to accommodate higher bandwidth with greater speeds. Communication applications are increasing rapidly, and each of them has features that require higher bandwidth and speed. Some of these advanced applications are video technology, OTT content, and IoT. The increasing use of fiber optics in these applications leads to the need for more network architectures such as FTTH and FTTB. The demand for RFoF technology is expected to grow in India and the Middle East in the coming years. Most of the countries in the Middle East and North Africa (MENA) are in the emerging or developing phase; the demand for broadband services in these countries is increasing significantly. Wireless communication is an integral part of daily lives; hence, cellular mobile operators are investing more in their cellular coverage. There is a limited reach of wireless coverage in rural and densely populated urban areas due to the high cost of terrestrial backhaul equipment, which is a barrier for cellular expansion. Satellite helps to increase the penetration of cellular connectivity technology in these areas to provide cost-effective services with improved performance and reliability.